Pericardial window creation and thoracic sympathectomy are relatively simple procedures that can be performed by uniportal VATS approach. Successful drainage of pericardial effusion via a pericardial window can improve quality of life of patients and reduce frequency of admissions, while successful elimination of hyperhidrosis can improve patient satisfaction and self esteem. With the evolution of surgical techniques and emergence of uniportal thoracic surgery, excellent procedural outcomes can be achieved while minimizing surgical trauma to patients. 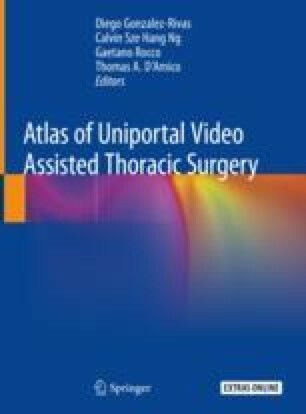 In this chapter, we will introduce and describe the latest uniportal approaches to pericardial window and sympathectomy. In addition, technical considerations and select clinical results will also be discussed. The online version of this chapter ( https://doi.org/10.1007/978-981-13-2604-2_8) contains supplementary material, which is available to authorized users.